I hate the term but I guess this is the epitome of shabby chic. 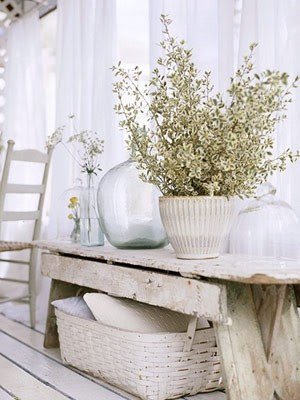 Worn and roughed up benches, chairs and storage with odd collected vases and lots of white. I guess it is all the different textures and materials that come through to make this very plain space more interesting and gives it a bit of depth that can be lost in white rooms.